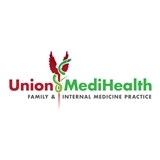 UNION MEDIHEALTH LLC (Union) - Book Appointment Online! Dr. Alina Borkowska, provides comprehensive primary medical care for patients above the age of 13: both preventive medicine and long-term complex medical care of broad spectrum of disorders. Dr. Borkowska performs DOT medical exams, work and school physicals, urgency procedures including wound suturing and I&D of skin abscesses, and routine gynecological exams with Pap smear. As a designated civil surgeon, Dr Alina Borkowska provides immigration medical exams. Vaccinations, ECG, urinalysis, HgbA1c measurement, PT/INR testing and phlebotomy for all other laboratory tests are all available on the spot. Radiology, CT scans, MRIs, emergency care and medical subspecialties are available in the same building. The visit was great! The staff is nice and the doctor is very nice and she makes you feel very comfortable.